Somehow, I missed this when it came out on Eco Salon (traveling might have been a factor...). In any case, this came out after interviews with several natural perfumers - including Mandy Aftel, Amanda Walker, Dawn Spencer-Hurwitz, and myself. Artisan Fragrance Salon - Get Your Tickets Today! Take advantage of the offer tonight before midnight! Tea Tray, a photo by Ayala Moriel on Flickr. 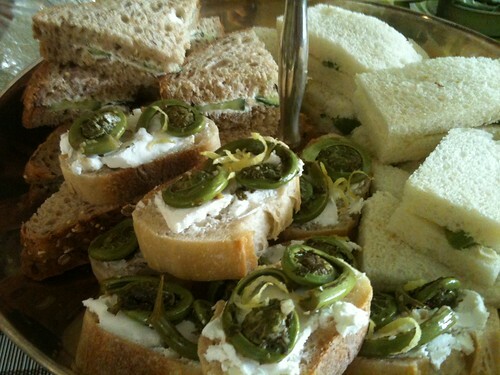 Sights, tastes and scents from my Spring Fling afternoon tea May 27th + a recipe for making your own Asparagus Mimosa tea sandwiches! This tea party was a first Afternoon Tea & Perfume Sensorium: it's similar to my other afternoon teas, only that guests paid in advance for the afternoon tea and a perfume bottle. So all they had to do was pick which one to get! Personal fragrance consultations for each guest made the process really fun, especially with friends coming to the event together. ArbitRary and Moon Breath roll-ons seemed to be a hit - as well as the ArbitRary candles! 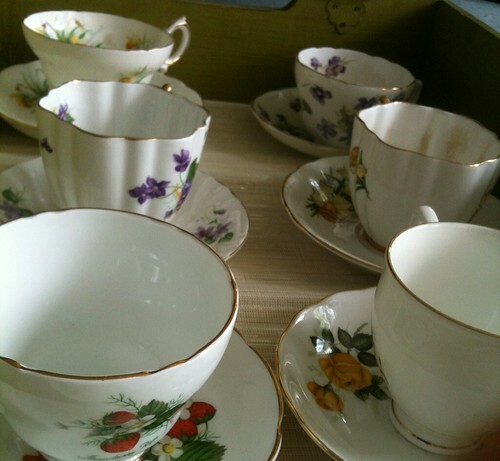 Beautiful vintage floral tea cups to celebrate spring: I was so thrilled to find tea cups decorated with strawberries, violets and narcissus in several antique shops and in Vancouver's flea market. The violet ones I've been hunting for a really long time to no avail; and the narcissus ones were a refreshing surprise - one of them is actually the exact same design as the violet I found later on... Tea cup collecting is a dangerous addiction... But at least they are useful! 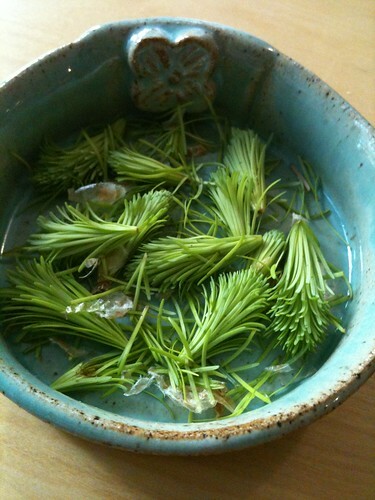 Juniper Ridge's wild harvested Douglas Fir Spring Needle Tip: delicious, citrusy, refreshing and the embodiment of the Pacific Northwest spring! Elderflower cordial - harvested and brewed by yours truly. Another symbol of spring in the Pacific rainforest. I picked them in Stanley park. Served chilled, with fresh mint sprigs and blueberries for a splash of colour. Jasmine pearl - a classic, and a must for a spring celebration. A taste of the exotic that only a fine jasmine tea can bring. These are actually rolled silver needles (white tea). 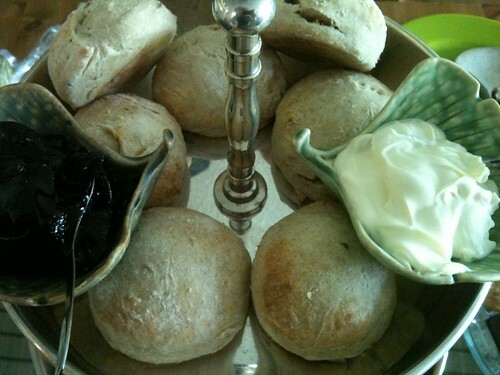 Tier 3: Malepi (Black Cherry kernels) + Anise Scones with wild harvested blackberry & rose petal jelly (by Wild West Coast Rainforest Products) and devonshire cream, of course! 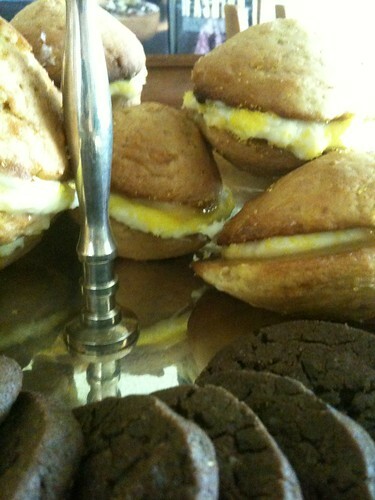 For those of you who missed it - you can enjoy some of the recipes on SmellyBlog and make these treats yourselves! Steam the asparagus just until tender and easily snaps (do not overcook it!). It should be bright green, rather than turn into a rancid olive colour... Slice, and add a teaspoon of butter. Grate the hard boiled egg, add the chopped tarragon, and add salt and pepper to taste. Spread softened butter on both slices of bread, sprinkle some of the asparagus mimosa mixture evenly in a thin layer (so that both slices can stick together). Chop off crusts (if desired) and cut the sandwich into 3 pieces or cross into 4 triangular quarters. Cover in an airtight container up to one hour from serving. Coconut Almond Pannacotta, a photo by Ayala Moriel on Flickr. - Dissolve agar agar with cold water until for about 10 minutes. - Meanwhile, cook the coconut and almond milk, sugar and vanilla bean until they reach boiling. - Grease 7 ramekins with a little bit of bland vegetable oil (I use almond oil or grapeseed oil). Best way to do this is with a paper towel or a pastry brush. - Pour the hot milk mixture into a saucer or a spouted dish. Divide evenly among all the containers. I like to place them all on one big tray, pan or tupperware - so nothing spills, and also for easy transportation in and out of the fridge! - Let them cool, uncovered, in the fridge. Once they stop steaming, you may cover them with a plastic wrap or a close with the tupperware lid. - Serve after at least 4hrs of refrigeration. 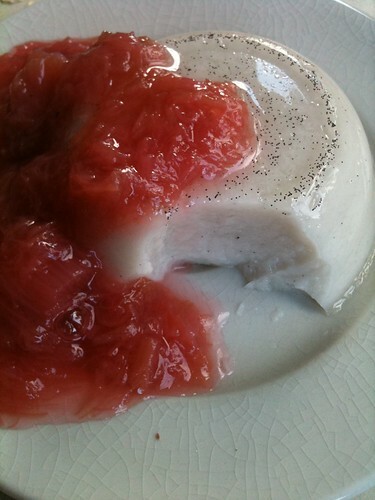 This pannacotta is a little more on the jelly-side, as there is not a lot of fat content. It's very delicious, light and refreshing - great to serve on warm spring days, and even on hot summer days. - Best served with an accompanying compote of your choice, i.e. 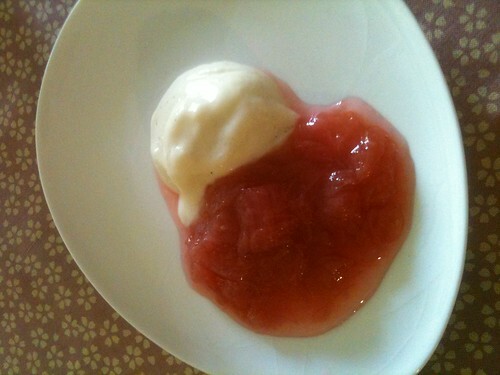 : Rhubarb Flower Compote. Call (778) 863-0806 or email. These are more than just an afternoon tea party - they are a feast to the senses and a real treat - an opportunity to relax, unwind and enjoy the innovative aromatic pastries, savouries and desserts infused with rare aromatics from my unique collection of exotic spices, herbs and pure botanical essences. Menu for our Spring Fling! Admission $100 per person (we will refund you for the shipping you were charged at the checkout), which includes a mini perfume (or a $50 credit towards any other product of your choice). If purchasing more than one ticket, please let us know the full names of the guests you're bringing with you, either by email, phone or in the comment box at the checkout. 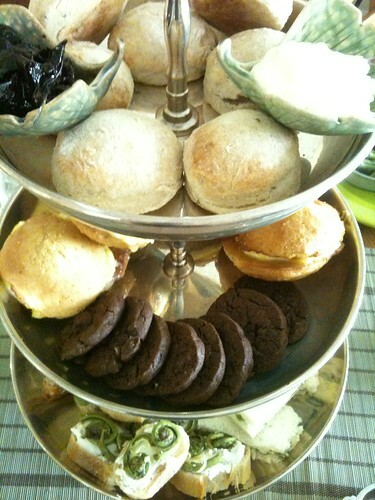 Looking forward to having you as our afternoon tea guests! And I'm especially stoked that Yosh Han will be helping me to host an evening of perfume making workshop at Alex Sandor Art Studio. We're also going to have a little "after party" (9-10) that's open to all, with a mini presentation about ORCAS fragrance (a 2012 FiFi Indie Awards Nominee) - and enjoy some ORCAS inspired cocktails and treats! Sooo - this workshop is offered at $135 just to cover the basic materials and supplies costs. AND - if you sign up by May 24th - only $120! There is space for 8 students only, so please let me know as soon as possible - the date is fast approaching! These days I'm not blogging much as I get ready for a big trip to California to meet up all my aromatic acquaintances and fragrant friends - and also for two very wonderful courses I'm teaching! 20 hours condensed course. Hosted at Persephenie's studio in Los Angeles. Space limited to 4 students. This course is a condensed version of our week long course about the Chypre fragrance family. It offers theoretical and practical guidance alongside hands-on lab exercises and experiments. The Chypre course covers studying the raw materials, learning about the history of the Chypre fragrance family and the sub-categories in this family. Students will be introduced to composition concepts such as perfume structure, and with basic technical skills such as how to blend an alcohol based perfume, how to write a formula. In the practical workshops that take place each afternoon, students will be building accords and creating simple solid perfumes, as well one representative perfume from the Chypre family. Introduction, definitions and discovering the Chypre family through its history (including sampling classic and vintage Chypre perfumes). Theoretical lectures on olfaction, fragrance evaluation, composition. Lab-sessions with hands-on experimenting of dilutions, formulas, etc. Our New Schedule is Up! Check out the new schedule for all of our upcoming events, classes, etc. You can visit our Calendar page for more details, but also a simple click on the "BOOK NOW" button on SmellyBlog's right side bar will lead you there! It is divided into "Services" (i.e. : privately booked studio appointments, perfume & tea parties, and custom perfume consultations); and classes (including all of our workshops, natural perfumery courses, etc.). Hope you will find the tool user-friendly and helpful! Looking forward to seeing you in my next events, workshops and classes. Last Day for Mother's Day Deal! 15% off on everything you get on our online boutique (sample packages and wardrobes are the only exception - for anything else, you get 15% off whatever is the price listed currently online). To activate this deal, please add the code "MOM415" in the comment box in the checkout. Your order will be refunded manually after we receive it on our end. 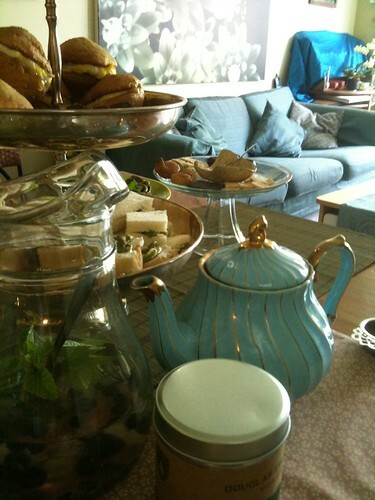 Also, we have a deal via Groupon for an Afternoon Tea & Perfume Sensorium. Get a ticket to one of our own events (which also gives you a $50 gift certificate); or purchase a voucher for your very own event! Our tea parties have been featured in Taste & Sip Magazine and Fresh Cup Magazine, and make a perfect memorable experience for bridal stagettes, baby showers, anniversaries and other triumphant moments in life you'd want to celebrate with close family and friends! The blind leading the lame., a photo by alexstoddard on Flickr. How much is our judgement of smells affected by sight? In his fascinating book "What The Nose Knows", smell scientist and sensory psychologist Avery Gilbert counts several interesting experiments that explored the relationships between visual appearances' effect on how scents were perceived. It turns out that we are far more prejudiced about the odours that go through our nostrils than we may think. For example: when smelling a colourless liquid versus coloured liquid, test subjects perceived the coloured one as stronger than when they smelled the same one bind-folded. Reverse perception was reported when the subject were not allowed to sniff the smell of a beverage, but rather sip it through a straw out of a cup with a clear lid (FYI: our sense of smell plays an active role in what we call "tasting" as it is a huge contributor to flavour - the scent of food is experienced differently once it's inside our mouth and rises to our nasal cavity and olfactory bulbs). I wonder if this has any implications on, say, genetically modified food? Would we perceive a genetically-engineered apple-flavoured banana as more banana-like just because of it's appearance, or will the apple flavour come through properly? Yet another reason to not bother with genetic engineering in food... Likewise, when a bottle of essential oils is mislabeled - it can really catch even the most avid nose off-guard. A few weeks ago, a bottle of "fresh ginger oil" arrived, full of no other than rose geranium oil. Occasionally, I will still re-visit the bottle and try to convince myself of its gingery qualities... to no avail. P.s. Avery Gilbert also has an excellent blog on pretty much everything related to smell-science, First Nerve. Tulips in Coal Harbour, a photo by Ayala Moriel on Flickr. Spring is beautifully shaping into a promise of summer. The temperatures are slowly approaching room-level in the outdoors (a rare event in these parts), and everybody seems excited about that. Lilacs are early this year, and I'm taking full advantage of the fact, sniffing nosefuls whenever I can and scheming how to coax a few clusters of lilacs under the influence of alcohol to make a tincture or infusion. With muted notes of lilac, cucumber and wheat and sweet En Passant brings to mind a lilac hesitant to open its buds fully but hides beneath it a little jasmine and heliotropin surprise. Balsam poplars are in bloom, permeating the air with their sweet, coumarin cotton-candy aroma, and causing me a sneezing fit whenever I happily walk by them. The sadly discontinued ambery fougere Sève Exquise (Victoire Gobin-Daude) captures so well the spirit of the spring on a sunny, yet windy and rather cool spring day walking under those trees and catching the little water taxi to Granville Island. Balsamic and warm like baked cotton wool. 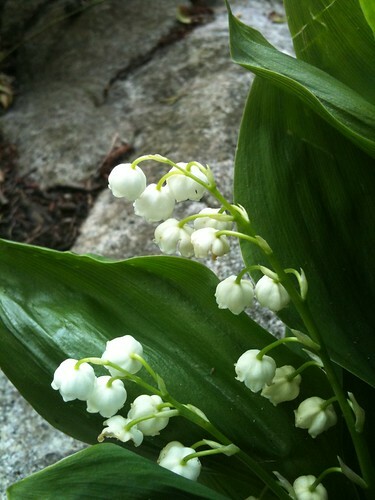 Lilies of the Valley are as rare as true love. For the two weeks when the buds and white bells are around, I'm anticipating the blossoms and keep running to my bottle of Diorissimo, which I make a point of wearing every year around this time, even though it seems to call for a most regal occasion I can only imagine partaking in. Linden Trees are not in bloom quite yet, but I love Persephenie's Linden Blossom Dry Oil Spray. It has a citrusy, coconutty and fun attitude, and is especially great when traveling because it's only 50mls and will fit in your carry on; plus it can be used both to moisturize the skin and style the hair. So pretty. Secret Garden - on rainy spring days, this perfume brings comfort and mystery to an otherwise grey and dull day. It gives off the sense of silk brocade and teak wood furniture saturated with an old perfume. Mitsouko - what a darling perfume. When I stocked up on 5 bottles of it (different concentrations, mind you) I haven't had quite enough insight on how sad I'd be getting very near the end of my 1st flacon. Even when I think I'm not in the mood for it - there was not a single time I wear Mitsouko and regret it later. It brings comfort and a pensive, contemplative perspective to life and I love it for it. Elderflowers - my new discovery this spring - they are the "mimosas of the forest" to me, and I'm on a roll with these (in case you haven't noticed!) and tonight, I've steeped some of them in a rhubarb and black currant compote. I'm so smitter with everything that comes out with elderflowers scent. It's so refreshing to find a local, wild flower with such a prominent scent that I'm almost wondering if it's too good to be true that it's so yielding to my effort to extract the scent - in both aqueous and alcoholic infusions. Rhododendrons - The yellow ones are already in bloom in our garden, and even though it's not their peak quite yet, the courtyard is filled with their nearly cloying, lily-meets-carnation perfume. Upon opening the gate, one will wonder what wafts around, and the flowers are not the first thing that would be anyone's guess. The scent is spicy, intoxicating, with hints of rose and peony spiciness. Sweet Violets are peaking their heads among the greenery, and I'm reminded of some favourite violet scents: Verte Violette with its crisp, almost milky crushed leaf appeal; Voile de Violette with it's velvety softness; and Après l'Ondée, with its melancholy spring shower whisp of anise. And until summer truly arrives, and there are real freesias in bloom, I'll enjoy me some Ofresia by Dyptique - crushed greens so delicate with a touch of jasmine and peppery, crisp freesia. What flowers are in bloom in your part of the world? And which perfumes are you enjoying the most these days? SmellyBlog is pleased to announce the winner of Lys Méditerranée decant - from last Monkey Monday's giveaway: Dionne. Please contact me ASAP with your mailing addy so I can send this beautiful lily perfume your way! As you may have gathered, this week is dedicated to my students who hailed from all parts of North America to study natural perfume with me. I will post at the earliest convenience, continuing to celebrate this spring and motherhood (Mother's Day is on Sunday). Fiddlehead, a photo by Ayala Moriel on Flickr. Fiddleheads. 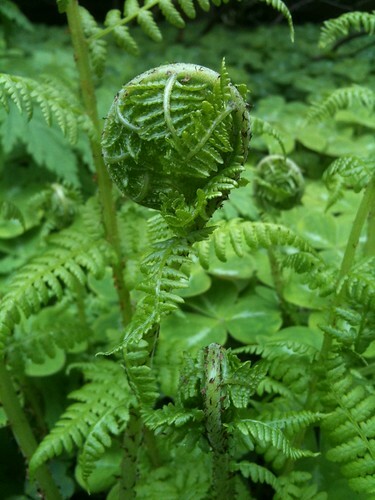 Ferns. Rhododendrons. Lilacs. 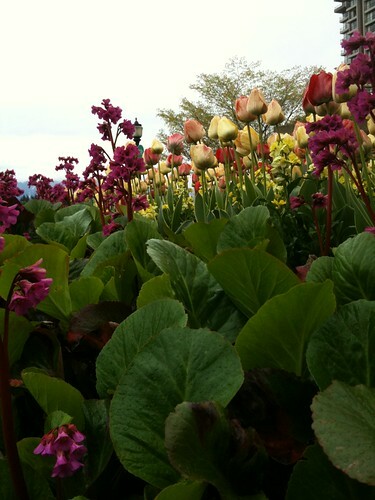 Spring's awakening... Best time to learn perfumery in Vancouver! This week I'm excited to be teaching my Fougere week long course, where students will be learning about the history of this fragrance family, raw materials, composition and how to attune their noses to the many wonderful scents in the air! Fresh Rhubarb, a photo by Ayala Moriel on Flickr. This rhubarb compote brings the freshness of both the Canadian and Mediterranean spring, combining the rhubarb tartness with cheerful orange blossom aroma. 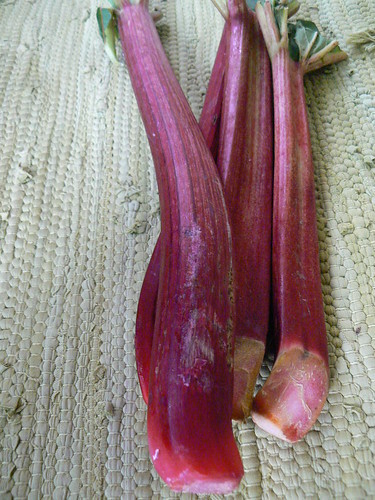 Rinse rhubarb and discard any green parts (they are poisoneous). Cut into thick slices. Place in a sauce pan. Sprinkle sugar over top. Cook covered on a medium heat until the rhubarb is soft, about 5 minutes (check on it often to stir and to make sure it does not get scorched, stuck to the bottom, etc.). Add the orange flower water at the end of the cooking, to maximize its flavour. Bring down to room temperature and pour into an airtight container. Store in the refrigerator up to one week (you can also eat it warm, but it won't taste as "fresh"). Serve with vanilla ice cream, frozen yoghurt, fresh yoghurt or unsweetened whipped cream with a hint of vanilla. * Orange flower water is the distillation water from making neroli essential oil. It is a very popular ingredient in Middle Easter, Persian and East Indian cuisine - where it is used in countless desserts such as ice creams, confections and pastries. Today I've embarked on my papermaking adventures, although the odyssey have began a couple of years ago, when I began to collect scented scent strips, filters, tissue paper and other scraps of paper that got tainted with scent in the perfume making process. For a while now I've been asking myself - what should this paper smell like? I've been torn between designing a particular scent for it; and between using the magical randomality that occurs from years of collecting scented stuff. The smell of "everything" that I have around - which is so well presented in the bagfuls of scent strips that have been collected over the years. Jasmine, patchouli, rose, vetiver, oakmoss, odds and ends of spilled Film Noir, Immortelle l'Amour and Eau de Tinkerbelle's haunting soliflore boronia... These all seemed too precious to be thrown into the regular recycling basket. 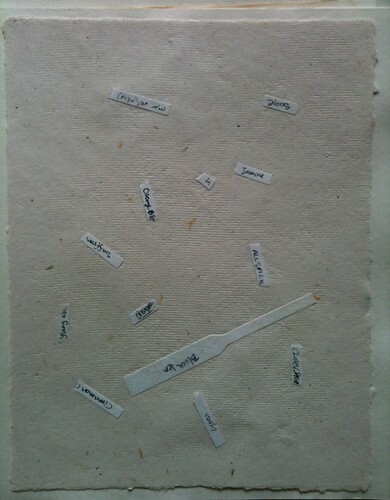 Instead, they are a whispering testament to the olfactory quests that have been occurring at my studio: students' struggles with identifying an essence on a blotter strip in a "blind test"; me in a search for a particular accord or winning combination to tell the story of a Coal Harbour morning... They all somehow make it to the pages of this fragrant story, that seeps through the fibers of paper and travels beyond time. I find the experience haunting; and today - after over 2 hours at my little "mill", I've discovered how potent this paper was. The entire house smells of this quiet random array of notes. It refuses to leave the equipment it's been touching. And I find this all to be exciting and also very reassuring - that all this collecting is going to account to something quite intimate and personal. Like the fingerprint of my studio in the moist pulp of paper awaiting molding. Spring Forest Risotto, a photo by Ayala Moriel on Flickr. Yesterday's foraging expedition got me in love with the rainforest all over again. And so I've decided to cook a special risotto for dinner tonight, that uses fresh seasonal vegetables and also makes use of unusual ingredients that spark my imagination. I got a bunch of fresh, crisp organic asparagus at the farmer's market, and I've been thinking long and hard about what stock would work for an asparagus risotto? 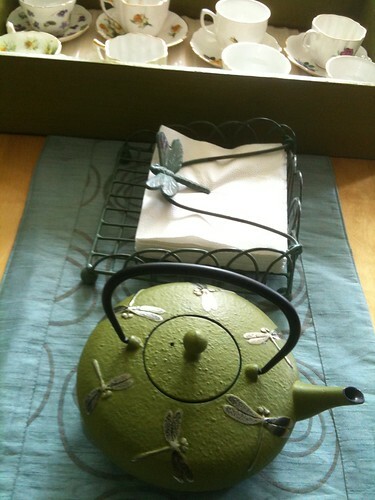 A little voice in my head kept whispering something about green tea. But I couldn't pick the right one (and using the finest green tea I've got in a risotto seemed like a sacrilege...). But I knew that there was something better out there on my tea shelf... And finally it came to me: Hall's Fir Tip Tea! I set to action, using young organic leeks instead of onions of shallots, sauteeing them in ghee (it's better than butter for cooking, in my opinion, as it doesn't scorch so easily). Then came the carnaroli rice, and quickly I realized that I was out of white wine... And that the white wine would have probably killed the "tea" flavour anyway with it's cheesy, yeasty afternotes. So of course, I used the last few drops of Hendricks' gin I had on hand instead, to much delight, and than proceeded with pouring the infused fir tip tea, a little bit at a time until it absorbs completely into the rice. To make the fresh, delicate tastes really shine I've added no spices at all except for Maldon sea salt flakes. 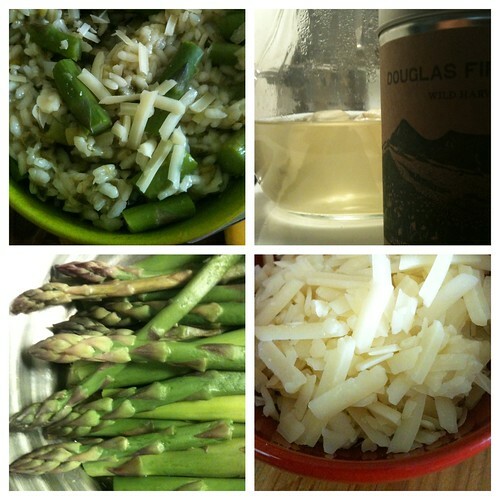 And the asparagus was steamed on the side and then incorporated into the risotto just before serving, and than topped with parmesan cheese. The result is a very light, refreshing risotto, full of flavour of the forest and great contrast of textures: crunchy tender asparagus vs the creamy, starchy rice. The forest notes are not overpowering but are definitely there in the best way. - Steam the asparagus until it snaps easily (do not overcook!). Cut into short pieces. - Sutee in ghee until tender and transparent. Add a pinch of salt. - Add the gin and cook until the alcohol evaporated completely. Add a pinch of salt. - Once all the liquids absorbed into the rice, and the rice is tender (not mushy - it should have a consistency similar to an "al dente" pasta), it's ready. Remove from heat. - Adjust seasoning (salt only if required). You may want to ad a tiny bit of shaved juniper berries as well. Pepper is not appropriate for this dish as it's aroma will overpower the tea infusion. 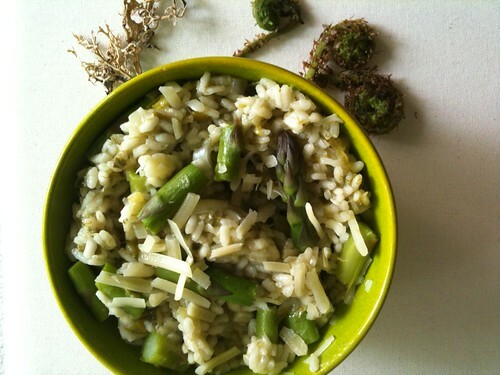 - To serve - mix the rice with the asparagus pieces, and with Parmesan cheese to taste. Add a few larger pieces on the top for garnish. Add more shaved Parmesan cheese on the top. 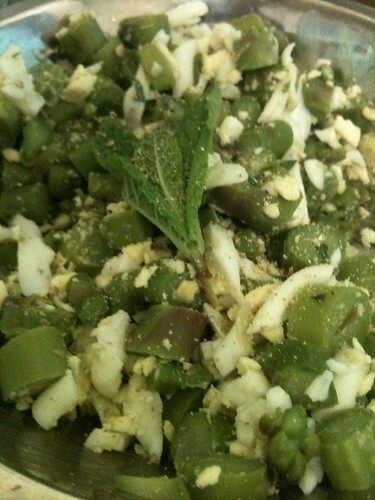 - This recipe will go great with wild asparagus as well, of course. 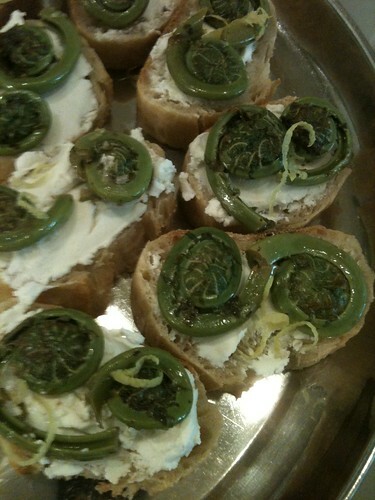 You may also use fiddleheads while they'r in season in place of the asparagus. Fragrant Gift from the Forest, a photo by Ayala Moriel on Flickr. 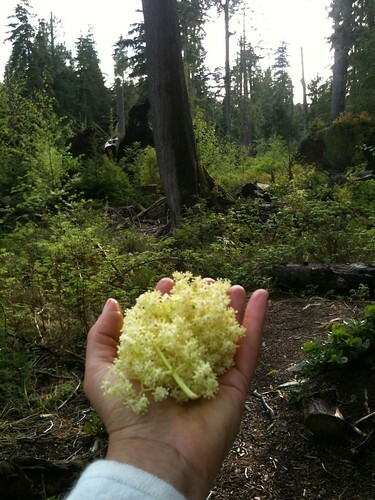 Yesterday we foraged for fragrant elderflowers in Stanley Park. It was a typical spring day: incidivisive weather, ranging from trickling rain, pounding hail and at long came the beautiful sunny afternoon I was waiting for, so I can go pick elderflowers. Elderflowers are my new fling: we've only just met at the farmer's market on Saturday, and I'm already smitten with its delicate, berry-like aroma. And it took me only one time of enjoying the fresh cordial (or shall I call it iced flower infusion), to be convinced that these are worth traveling the miles for and risking a dirty shirt and a slip in the rainforest swamp for it. It was beautiful, and I remembered seeing many of the shrubs along the trails I frequent on my weekend strolls; so I went wearing my best clothes without realizing how adventurous humans get when searching for food. White cashmere sweater is not a proper attire for such an adventure; and neither is a skirt; unless you want your bare skin to get kissed by cold wet moss. I was very glad that at least I had the forsight to put on good hiking boots though, which prevented me from slipping into the many mini-swamps that crawl alongside most of Stanley Park's trails. A few tips about picking elderflowers: shake them well from the many little bugs that inhabit them before you take them home. You might still need to shake them again before using them for your infusions; but it will be a lot less messy. Elderflowers are supposedly more fragrant before noon. If your weather allows, go for it and head out in the morning. I had to wait till late afternoon and they were still very fragrant and beautiful. Also, I find that the smell better after they are picked than straight on the branches, where at times their honeyed berry scent is overpowered by animalic nuances reminiscent of wet dog coat and skunk spray. Which might be why I never was tempted to forage them till this year. Thank the farmer's market for exposing me to the picked flowers! Boil the water, and pour into a pitcher over the flowers, sugar and lemon. Infuse overnight (or for 12 hours), covered in a cloth. Refrigerate and use within a week (there is no need to strain the flowers and fruit, they will continue to infuse the water with their aroma). To serve: pour half a glass of the flower infusion through a strainer, and half a glass of San Pellegrino or other unsweetened soda. Add ice cubes if desired. Enjoy! Most recipes call for citric acid (which is a preservative, but also kills the delicate floral aroma, in my humble opinion). My recipe won't last as long, but is true to the flowers. Dissolve the sugar with the boiling water. Add the lemon wedges and the flowers. Cover with a cloth and infuse overnight (or for 12 hours). Strain through a fine sieve or mesh cloth, and store in sterilized containers, in the fridge. This cordial may be used to taste (it's very concentrated) in soda water, in addition to iced teas, lemonades, poured over ice cream, and used in cocktails. 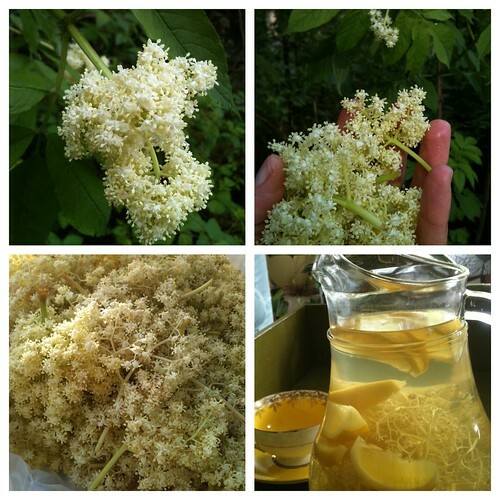 You may also use elderflower to make your own elderflower liquor - I haven't yet, but will this weekend, and if it goes well I will share with you my recipe. Nav at Beauty Huile is having fun harmonizing two very different personalities: Megumi body oil and White Potion body oil. Read her review of each alone and together. Lilies on the Rocks, a photo by Ayala Moriel on Flickr. With the lilacs blooming early, and glimpses of sun penetrating the thick blanket of clouds that usually conceals Vancouver - one thing is certain: spring is here! These delicate flowers were spotted last year in the garden of the lighhouse keeper at Lighthouse Park in West Vancouver. They are especially stunning when their delicate blossoms are set against a rocky backdrop. Today I'm wearing Grin - a perfume that similarly to lily of the valley's delicate white bells - always puts a smile on my face. Lilies don't lend their aroma to the distiller's efforts, and it can only be enjoyed naturally from the fresh flowers. Grin is as closest to that giddy feeling of spring that I get inhaling the fresh flowers and feeling their cool blades caress my cheeks. It's all thanks to the magic of boronia absolute, a rare flower from Tasmania with a peppery-freesia aroma, paired with green galbanum, sultry jasmine and demure rose.